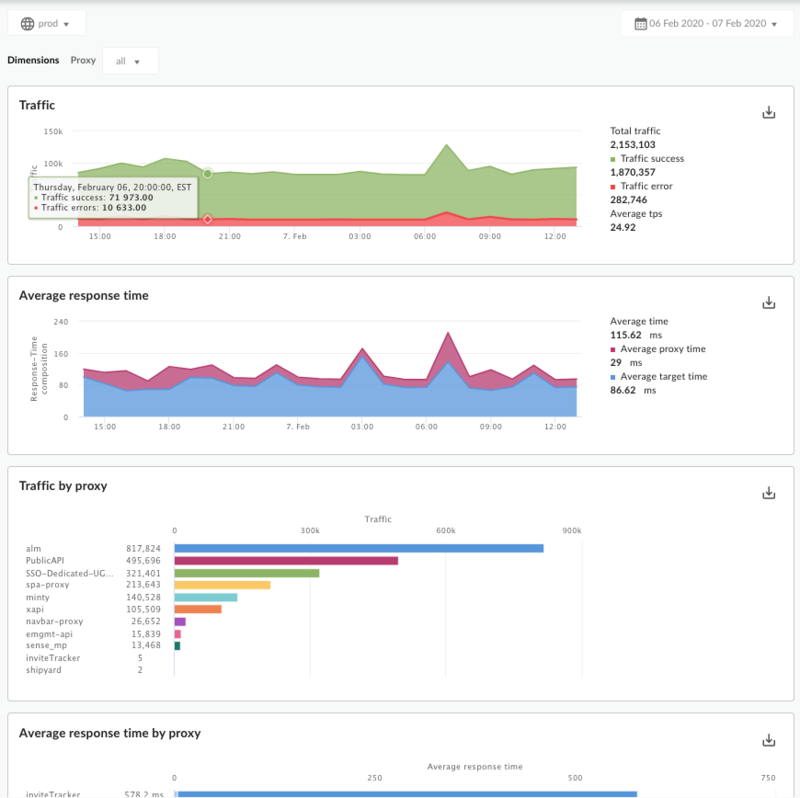 The Proxy Performance dashboard helps you see API proxy traffic patterns and processing times. You can easily visualize how much traffic your APIs generate and how long it takes for API calls to be processed, from the time they are received by Apigee Edge until they are returned to the client app. Video: Watch a short video for an overview of the Proxy Performance dashboard. Total Traffic The total number of API requests received by Apigee Edge for an API environment in an organization. Traffic Success The total number of requests that resulted in a successful response. Error responses do not count. Traffic Errors The total number of all API requests that are unsuccessful, that is, the request does not deliver a response as desired by the end user. The count includes both Proxy and Target errors. Average TPS The average number of API requests and resulting responses per second. This chart measures the average for all proxies. For individual proxies, see the Average Response Time by Proxy chart below. This value is calculated as the average of the Total Response Time minus the Target Response Time for all API calls made to an Apigee Edge organization environment. It's basically a measure of how much time the API calls spend flowing through Apigee Edge itself (in milliseconds). <Proxy name> For the specified API proxy, the number of recorded API requests and responses. For the specified API proxy, the average of the Total Response Time measured for all API calls made to an Apigee Edge environment. The Total Response Time is the amount of time it takes for an API call to Edge to return (in milliseconds). Hover over the graph to see the total amount of time spent on the proxy side and the target side, as well as the average. A light gray icon means means you can sort it; if you mouse over a light gray icon, it turns blue. A dark gray means it is currently sorted. This dashboard uses standard controls, like the date and data aggregation selectors, hovering over graphs for more context, click and drag to zoom, exporting data to CSV, and so on. To learn more, see Using the analytics dashboards.